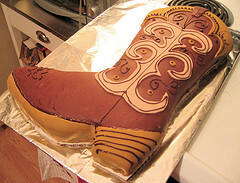 A western theme party calls for cowboy cake and other related fun cake designs. You could create a western scene, with cowboy figures placed on top. You can also make a cake about cowboy related items, such as a horse cake or a star shaped cake to be a sheriff's badge.